Soundboard is a standout among new WordPress music themes with amazing features for the music industry. The Internet is the best way to develop a following for anyone in the music industry these days. 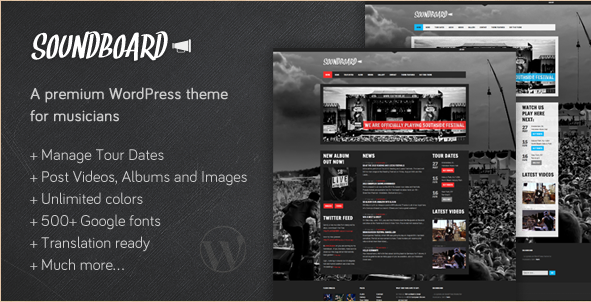 The Soundboard WordPress theme is built for promotion and makes getting your music out there as easy as a few clicks of your mouse. You get a slick, professional-looking website that will impress both your fans and anyone interested in finding out more about your band. Soundboard’s first benefit is its professional look, and the colors are endlessly customizable. Your band’s logo can easily be added, resulting in a theme that looks like it was custom-designed specifically for your band or music management company. Furthermore, none of the customizations to Soundboard need any kind of computer coding expertise. 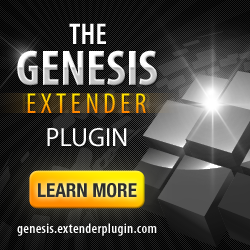 Modifying this WordPress theme is simple enough for even those with limited webmaster experience to execute on the fly. Other music-related benefits include the fact that it has a media player so that you can host your own files without relying on a third party host like YouTube. This is something that many musicians prefer. Soundboard provides a JW player, giving you a minimalist and easy to implement way for people to pay various media types on your site. There is also a widget for you to post your promotional info like your tour dates (and include a URL for ticket purchases) and another for your Twitter and Facebook feeds as well as for your latest albums. The Soundboard WordPress music theme also provides you with galleries for your pictures and videos. 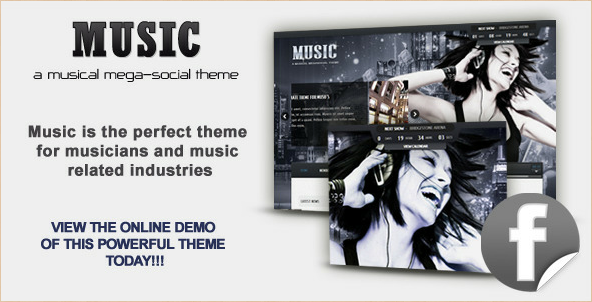 Do you want a theme that is music-oriented but with enough flexibility to be used for writing? 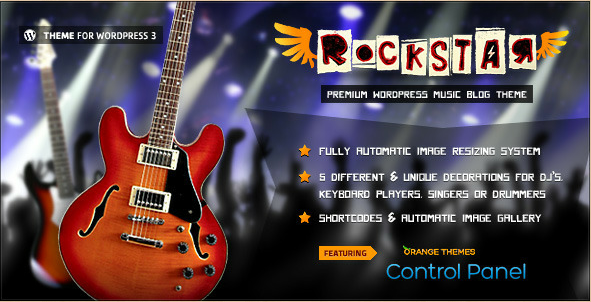 Rockstar is one of the best WordPress themes for bands, but may also be used by those who want to publish reviews of songs or bands. Rockstar comes with a number of customization options like the musical instrument that you use as the background to your website, you get a choice that includes guitars and drums. Are you a DJ? You get the option of a turntable picture as well! You also get a popup banner as well as a player for Mp3 files and a section for displaying your Twitter feed. You even get a special Orange Themes control panel to make configuring the look and the feel of your WordPress installation easier. Rockstar also gives you the ability to generate as many sidebars as you like on any page. The name of this theme says it all – the Music WordPress theme is designed to help you get word of your band or other musical act out to the world. If you are busy creating music and touring, you probably will not have much time to build a website so Music is designed for easy customization and does not require that you be an expert in web development. Social networks are among the best ways for a band without a huge following to get their music out there. One of the outstanding features of the Music WordPress theme is the included Facebook app which makes it easy to use the world’s most popular website for promotional purposes. Some of the features are entirely unique to the Music Theme and Facebook App. For example, you can add your playlist with music hosted on your site to your page on Facebook. Set up your band’s Facebook fan-page once and it will continue to be updated automatically. This WP theme is built to promote and inform visitors about events that could easily be used to manage tours. Its bold, unusual look allows it to draw attention to any event it is used to promote. 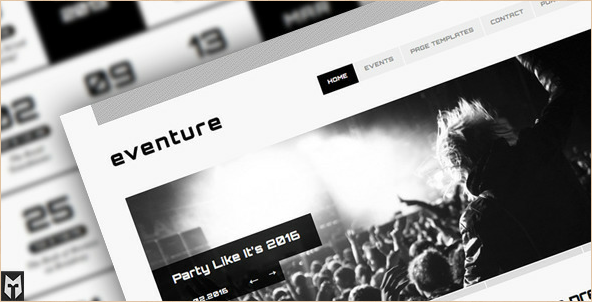 Eventure is another WordPress theme that is perfect for a band but may be used to tell an audience about other types of events as well. Users get a template that can be viewed equally well across a range of devices and browsers. They also get a one-of-a-kind calendar that can be used to count down the days to a particular occasion, like the date of an album release or the start of your band’s tour. The calendar is completely unlike anything seen on other event themes. You can easily insert your band’s logo or any kind of logo you wish, and there is a user-friendly control panel that allows you control all aspects of the theme. 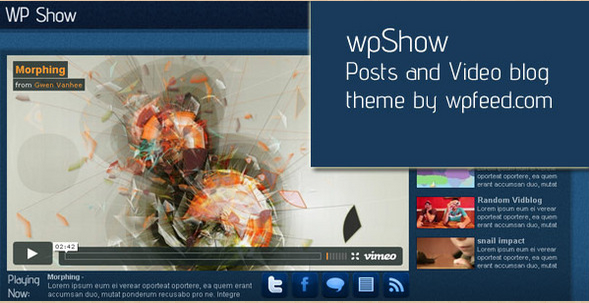 You get a slideshow that you can use to show off images to your website’s visitors as well. 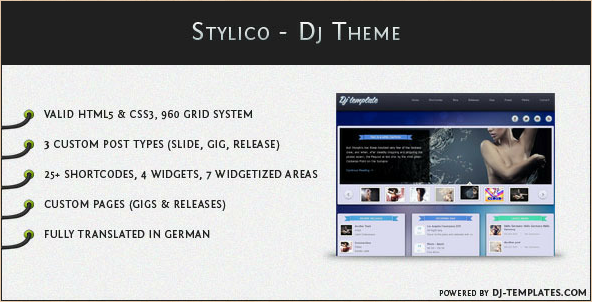 The Stylico WordPress music template is designed specifically with DJs and music producers in mind. Professional DJs who work in multiple clubs will be able to be able to appreciate features like being able to tell fans about the next gig. With the Stylico WordPress theme you can schedule your gigs via the theme’s gig manager plug-in. The gigs are managed with custom posts that allow you to input the location of the gig and allow your visitors to use Google Maps get directions to it. You also get a music player so that your fans can listen to music hosted on your website without you having to use a media host, doing this is as simple as uploading an MP3 file. 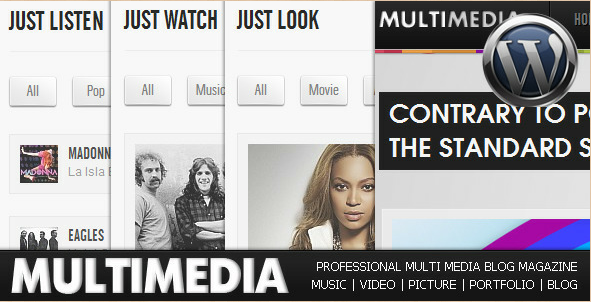 The theme comes with a custom slider that allows you to post as many images as you want, while being easy to modify. You can switch to Stylico without having any specialized technical knowledge. This DJ theme allows you to build your following effortlessly while lining up paying jobs. This WordPress audio theme is designed to provide your band with an original and striking website, but it may be used for nightclubs as well. The Nocturnal WordPress theme provides a fresh, hip feel as a means for communicating with a potential audience for your music or with your nightclub’s patrons. It even comes with designs for flyers that you can use to promote your shows. The logo can be easily updated to your own, and there are endless color options for your links. You also get to use your own images as backgrounds for your pages. The homepage has an AJAX slider that features your posts and helps the website seem even slicker and more professional; it also makes the site load faster for visitors. The Nocturnal WP theme comes with an HTML5 player for music as well so that music can be played on specific pages. 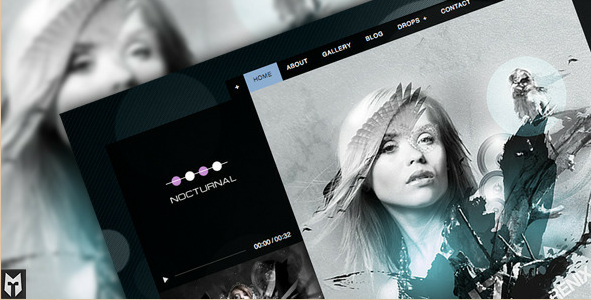 The Nocturnal theme includes jQuery animations and effects to give a modern, high technology feel to your website. 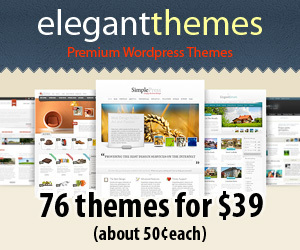 This theme is outstanding in that it is built to be easily customized to your needs. It comes with a color-picker that allows you to change the page colors to whatever you want, so that your options are essentially unlimited. 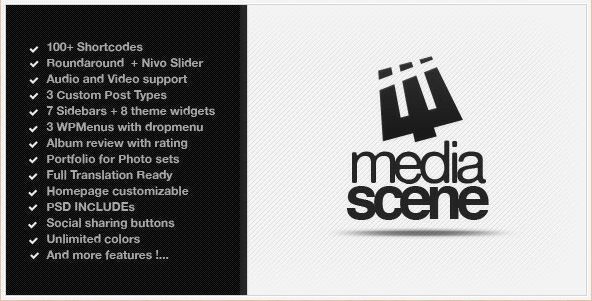 You also get a front page that may be modified with blogs and sliders as you see fit. You also get portfolio pages and social media widgets, making the theme useful for any number of purposes including showing and sharing visual media. Of course, the most important feature for bands is the support for audio and video. The wide range of social media sharing buttons make publicizing your music easy and the album rating system allows you to use MediaScene as a blog for reviewing music instead of one for a band. There are added little touches like an AJAX contact form to make the theme that much more appealing to visitors. This theme is not only flexible regarding the music media it can be used to display, it can also be altered when it comes to customizing your website’s appearance. The author has also included 11 videos to help you get your WordPress site up and running. 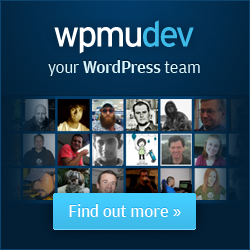 The title tells what the WordPress theme can do. It can be used as a portfolio site to display everything from visual media to audio files. It has been designed to show up equally well in on all the most widely used browsers and on a variety of devices. The Multimedia theme comes in seven different styles: Happy, Piano, City, Play, Cassette, Tape, and Music Live (default). Each style comes with a different background picture and color scheme so that you can customize your site to your band’s style. If you need more than just a blog theme for your band or music act, you may want to consider Phiyaz as it allows you to build a community using WordPress as a platform. It allows your visitors to sign up and maintain profiles on your site, just as other community and social networking sites. Phiyaz looks the same on all browsers and allows you to change the skins and customize the background image. One outstanding feature is the ability to add galleries to each post and have more than one instance of a custom widget. This theme is geared more toward allowing you to display video content than anything else, for example there is a carousel on the front page that allows visitors to choose from any of the videos you have featured. You get to use it as a regular text blog as well. This WordPress theme comes with buttons that allow you to share your videos via the major social networks (Twitter, Facebook and Youtube among them) and comes with a sidebar that you can use for your widgets. However, if your band has a great visual presence this could be the WordPress music theme to promote your band’s antics and onstage showmanship.